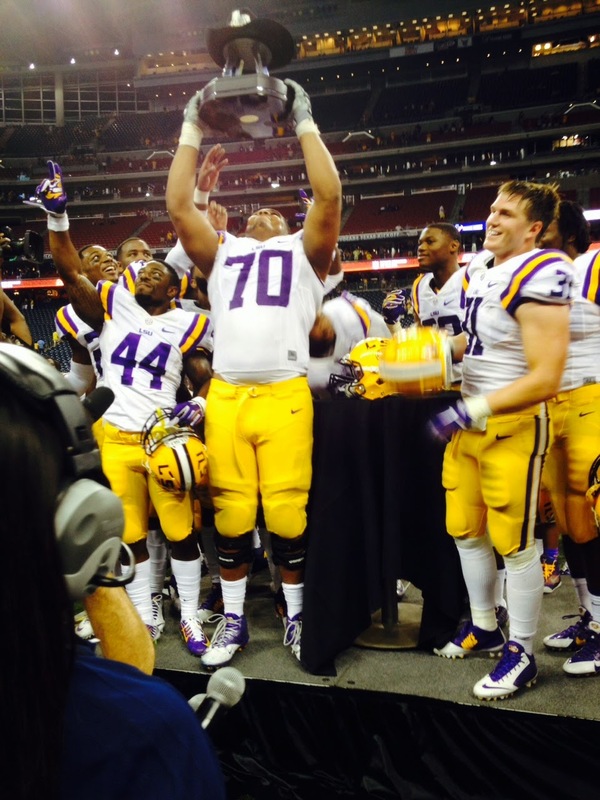 wins the Advocare Texas Kickoff. HOUSTON, TEXAS (August 30, 2014) Beginning the second half of the game trailing by the score of 24-7, the No. 13 LSU Tigers mounted a second half comeback that will send a message to many of the other SEC teams by scoring 21 unanswered points to down the No. 14 Wisconsin Badgers by the score of 28-24 in the Advocare Texas Kickoff at Houston's NRG Stadium on Saturday, August 30, 2014. The first half however belonged to Wisconsin, and the Badgers wasted no time getting on the scoreboard to start the game. In their first possession of the game, after an LSU punt, the Badgers drove 76 yards in six plays, capped by a 45 yard run by Reggie Love to make the score 7-0 at the 9:05 mark in the first quarter. Four minutes later, Wisconsin added a 51-yard field goal by Rafael Gaglianone. After a three and out by the Badgers, LSU quarterback Anthony Jennings unleashed a 80-yard pass to Travin Dural on the first play from scrimmage for the Tigers first touchdown of the season. Running back Melvin Gordon got into the scoring mode in the second quarter when quarterback Travis McEvoy handed off to the swift-footed native of Kenosha, Wisconsin for a 14 yard run at the 7:36 mark for the Badgers second touchdown of the game. Gaglianone again split the uprights for the PAT, to take the score to 17-7 at the half. In the third quarter, running back Corey Clement capped a six play, 75 yard drive that lasted 2:36 with a two-yard run for the Badgers third touchdown of the night. Gaglianone added the extra point to give Wisconsin a 24-7 lead with 12:24 left in the third quarter. Later on the in quarter, LSU kicker Colby Delahoussaye connected for two field goals of 30 yards and 47 yards to cut the Wisconsin lead to 24-13. Jennings to wide receiver John Diarse for the Tigers' second touchdown of the game. The Tigers opted to go for the two point conversion; with Jennings connecting with wide receiver Trey Quinn to cut the Badgers' lead to three points, 24-21. LSU scored again two and a half minutes later on a Kenny Hillard 28-yard run to take the score to 28-24 in favor of the Tigers. That drive lasted three plays and covered 53 yards in 1:45. With the win, LSU takes their series with Wisconsin to 3-0, having beat the Badgers on two previous occasions; September 25, 1971 by the score of 38-28 and September 30, 1972 by the score of 27-7. Offensively for LSU, Jennings completed nine of 21 passes for 238 yards and two touchdowns, while Hillard carried the ball 18 times for 110 yards and one touchdown. Sixteen of his carries and 88 of his yards came in the fourth quarter. For Wisconsin, McEvoy completed 8-of-24 passes for 50 yards and two touchdowns while Gordon carried the ball 16 times for 140 yards and one touchdown. Wisconsin will next host Western Illinois on September 6, 2014 with an 11 a.m. tart, while LSU hosts Sam Houston State on the same date with a 6 p.m. kickoff. UT-San Antonio in the first ever game at TDECU Stadium. HOUSTON, TEXAS (August 29, 2014) Houston Cougars kick off the college football season with a new stadium, a new attitude and hopes of a bowl game to cap off their 2014 season. The Cougars, who return 17 starters from 2013, will be looking to improve on a 8-5 record and a 41-24 loss to Vanderbilt in the BBVA Compass Bowl. Their 5-3 record in the American Athletic Conference in 2014 placed them fourth in the conference behind No. 10 UCF (8-0, 12-1 overall), No. 15 Louisville (7-1, 12-1 overall) and Cincinnati (6-2, 9-4 overall). Houston is picked to finish third place in the conference in the preseason poll released at the American Athletic Conference Media Day in Newport, Rhode Island on July 29, 2014. Cincinnati was picked first with 311 points (17 first place votes) , followed by UCF with 296 points (seven first place vote) and Houston with 268 points (six first place votes). With the Cougars scheduled to open the 2014 season in their new TDECU Stadium, head coach Tony Levine has more than a few reasons to be optimistic. Houston's defense lead the nation with 43 turnover gains in 2013 and welcome back two players who will continue to have an impact on the field in 2014. Junior safety Trevon Stewart, who was named to the AAC second team in 2013 tallied four interception and forced 43 turnovers during his sophomore season. The Patterson, Louisiana native has been named to the 2014 Jim Thorpe Watch List, CFPA Defensive Back Trophy Watch List in addition to the first team by Dave Campbell's Preseason All Texas List, Phil Steele's Preseason ACC List, and Athlon Sports Preseason List. Sophomore quarterback John O'Korn, who threw for 3,117 yards and 28 touchdowns in 2013, will be back to lead the offense in 2014. O'Korn, who hails from St. Thomas Aquinas High School in Fort Lauderdale, Florida and was the 2013 AAC Rookie of the Year, has been tabs to the Davey O'Brien Watch List for 2014, in addition to the Maxwell Award and CFPA Quarterback Trophy Watch Lists. Houston kicks off its 2014 schedule on August 28 with an 8 p.m. CDT kickoff against the University of Texas-San Antonio at TDECU Stadium. The game will be televised on ESPNU and on the radio at KPRC 950 AM. Butterfly at the Pan Pacific Championships. Katie Ledecky blew away the pool in the 400-meter freestyle and lapped the field in the 1500-meter freestyle on her way to set world records in both. Ledecky, only 17 years old, finished the meet with five Gold medals - four personal events (200, 400, 800, and 1500-meter freestyles) and the 4x200-meter freestyle relay. Former Texas A&M University swimmer, Cammile Adams, from Houston, Texas, won gold in the 200-meter butterfly in an excitingly close race with a time of 2:06.61. The silver medal went to Japan’s Natsumi Hoshi who finished a hair behind with a time of 2:06.68. Third place Katie McLaughlin, from United States was an arm length behind at 2:07.08. Simone Manuel, from Sugar Land, Texas, received three medals. Simone won a bronze in the 100-meter freestyle and won silver medals on the 4x100-meter freestyle and 4x100-meter medley relay teams. 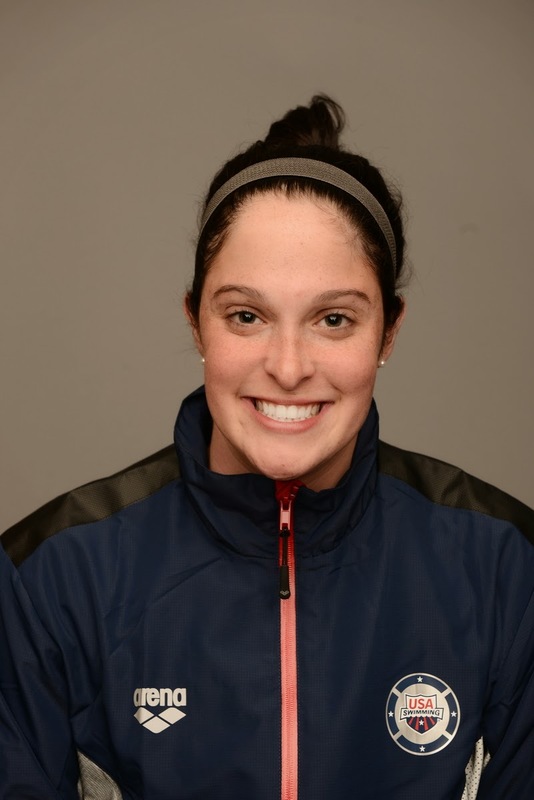 Her lead-off time of 53.25 in the 4x100-meter freestyle relay makes her the second fastest American female swimmer. Team USA finished the summer schedule winning the Pan Pacific Swimming Championship with a total of 40 medals. The host team Australia finished second with 26 medals. Third went to Japan who won 19 medals. WACO, TEXAS (August 24, 2014) Baylor scored goals early in the second half and late in the game, as the Bears defeated visiting HBU, 2-0, Sunday afternoon at Betty Lou Mays Soccer Field. Freshman Ellee Hall recorded HBU’s (0-2-0) lone shot attempt, which was on target. Senior Ally Murphy and junior Blake Martin played all 90 minutes in the field. Senior Patty Walrath made three saves and allowed two goals between the pipes. Justine Hovden led Baylor (2-0-0) with five shots, as she and Alexa Wilde had two shots on goal apiece. Michelle Kloss started in goal. Sara Martinson earned the win as she played the second half and made one save. There was no scoring as the teams entered halftime. Walrath made two saves in the opening frame. Hovden got the Bears on the board in the 53rd minute, as she ran down the right side and scored. Natalie Huggins gave Baylor some insurance with an unassisted tally in the 84th minute, as the ball was deflected in the box and Huggins scooped it up and kicked it into the back of the net for a 2-0 lead. HBU heads west next weekend to play New Mexico State Friday, Aug. 29 at 5 pm central. The Huskies end their road trip at UTEP Sunday, Aug. 31 at 2 pm central. Several of Huskies' freshman shine before strong crowd. HOUSTON, TEXAS (August 23, 2014) Even though they couldn't yet sit in the bleachers at Husky Stadium, about 200 fans lined the sidelines Saturday night as the HBU football team scrimmaged in its final practice before classes start Monday. "I think any time you can raise the importance of a workout, with much more of a game feel to it in terms of how we competed, you begin to understand more about the growth and maturity that's occurred in your returning players and the key thing for us as coaches is seeing how our younger players are going to respond," head coach Vic Shealy said. "I'm continually impressed with the way the freshman class shows maturity and the ability to compete, and I'm impressed by the overall football IQ of the program that we're trending towards and our ability to handle the volume of our schemes." When class begins next week, HBU will practice Monday through Thursday from 6:30-8:30 a.m.
"Tonight, we tackled much better than we did in the first scrimmage and that was good to see," Shealy said. "I thought our quarterbacks did more to create offense, even though sometimes it was after the designated play broke down, they showed the ability to save a play." Redshirt freshman quarterback Ka'Darius Baker and sophomore quarterback Jonathan Fleming split most of the snaps, while true freshman Isaiah Hall saw action in a third-down series. "We spent a good bit of time in the red zone because from an offensive standpoint, you've got to get the ball in the endzone, and conversely on defense you got to force them to try a field goal instead of the offense scoring," Shealy said. "We worked on coming off the goal line and I think it's important to get a mass of third down work in, both in the goal line and open field area." The Huskies scrimmaged for about 90 minutes, working on red zone, third down and goal line situations, as well as the kicking game. 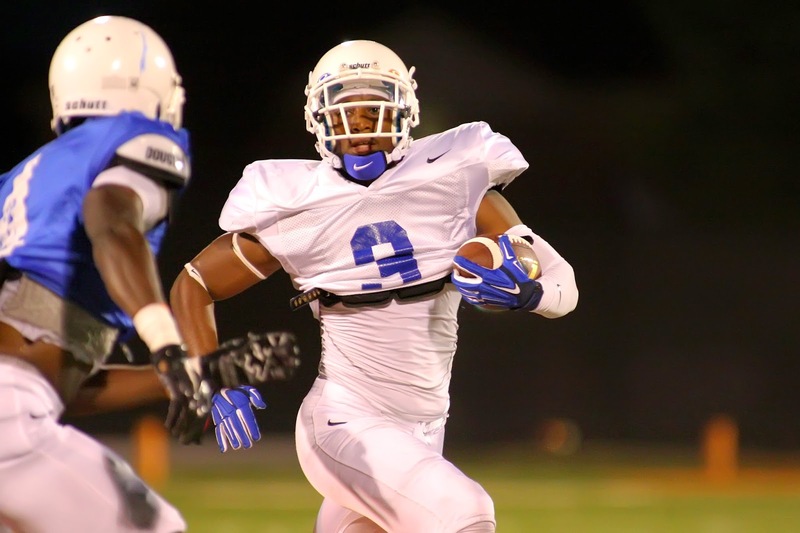 HBU's running backs dominated early with redshirt freshman B.J. Kelly taking the first four snaps, carrying four times for 25 yards and capping it with an 8-yard touchdown. Redshirt freshman Craig Bell Jr. scored on a 33-yard draw play by bouncing it out to the left sideline, and true freshman Terrance Peters Jr. scored on a seven-yard gain and added a tough 15-yard run for a first down. "Just to continue seeing us run the ball, I think we're doing a good job up front in terms of giving some holes to run through, but our backs are running with authority and toughness," Shealy said. "(Assistant coach) Shannon Kelley has done a tremendous job growing them, and I think tonight one of the things that really showed was Terrance Peters and his ability to play fast, be able to cut open field and make people miss. That's just an area now where it will be interesting to see who starts for us, because we've got about four guys where it doesn't matter who's in the ball game right now. It's a great challenge to have. True freshman wide receiver D'Angelo Wallace made several receptions, including a 54-yard touchdown from Baker and a 30-yard gain on a third-down conversion on which Fleming scrambled to his right and hit Wallace on the sideline. On the defensive side, freshman Dominique Barnett and junior John Wesby each grabbed interceptions, while Kameron Lecoq had a sack. "D'Angelo Wallace is just a guy when we recruited him, what we were looking for was a guy that was dynamic in his movement and great with the ball in his hands after a catch and a guy that really showed evidence of being a high-production player," Shealy said. "I wouldn't say D'Angelo's been a pleasant surprise, because we had high expectations for him, but it's been tremendous just to see him play fast and – frankly – I think it's going to be hard for our older guys to keep him off the field." "Then on the other side of the ball, there's Dominique Barnett with the interception he made and the consistency with which he's been playing," Shealy said. "That play is indicative of the way he's been playing the last couple of weeks and he's so explosive and the learning curve is continuing to go up. He's thinking less and playing faster." The Huskies are preparing for the season opener at home against McMurry on Sept. 6 at Husky Stadium to kickoff the program's first official season as a member of the Football Championship Subdivision (FCS) and the Southland Conference. SAN ANTONIO, TEXAS (August 22, 2014) UTSA’s Kaytee O’Brien scored on a breakaway with HBU goalkeeper, Patty Walrath, early in the second overtime, as the Roadrunners defeated the Huskies, 1-0, Friday evening. It was the first match of the regular season for both teams. Allison Abendschein and Rebekah Tovar each had two shots on goal, while Natalie Hager had a shot on goal. Walrath took the tough loss in goal as she made two saves between the pipes. O’Brien, who scored both goals in a 2-0 exhibition win at Incarnate Word last weekend, led the Roadrunners with three shots and scored on her only shot on goal attempt. Happy Orere-Amadu and Jenny Trommer had a shot on goal apiece. Katherine Tesno earned the shutout while making five saves. UTSA outshot HBU, 6-1, in the opening half, but the Huskies had the lone shot on goal in the frame. Each goalkeeper made a save early in the second half, but neither team mustered a threat the remainder of regulation. Tesno saved a Tovar attempt with under a minute remaining, sending the match into overtime. In the first overtime period, both Walrath and Tesno made a save and the Roadrunner defense blocked two shots to keep the Huskies off the scoreboard. Just two minutes into the second OT period, Kauwela Neal headed the ball up the field to O’Brien, who was one-on-one with Walrath, who scored at the 102:20 mark. UTSA outshot the Huskies, 14-11, in the match, but HBU held a small 7-6 advantage in corner kicks. The Huskies had five shots on goal to UTSA’s three. HBU concludes the opening weekend with a 1 pm kick-off at Baylor Sunday. SAN ANTONIO, TEXAS (August 21, 2014) The HBU women’s soccer team begins the 2014 regular season this weekend. The Huskies square off against UTSA Friday at 7 pm, then conclude the road trip at Baylor Sunday at 1 pm. HBU has not played both UTSA and Baylor since the 2012 campaign. UTSA leads the all-time series, 2-1-0, while Baylor leads the series, 3-0-0. 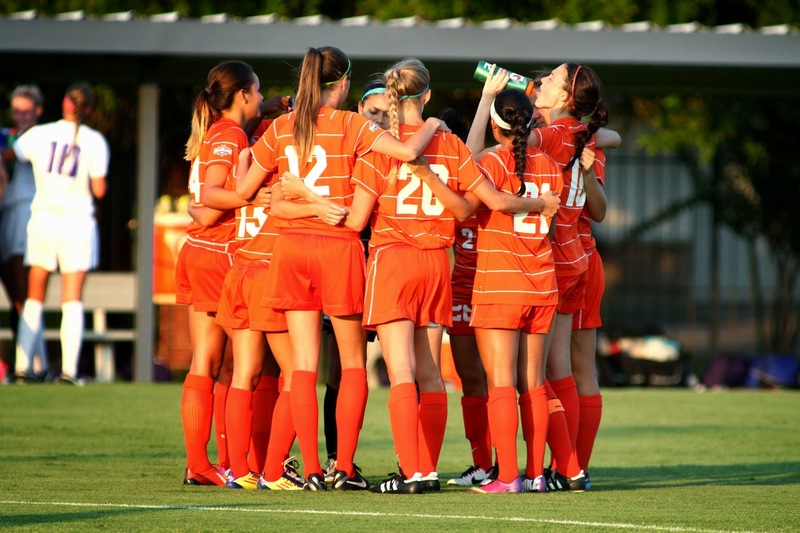 HBU lost at Texas State, 1-0, last Saturday night in an exhibition contest to begin the 2014 season. Texas State lost in the second round of the Sun Belt Conference Tournament last season. Natalie Hager and Rebekah Tovar each had two shots on goal for the Huskies. Patty Walrath played all 90 minutes and made five saves while allowing the one goal. The Huskies return 15 letterwinners and nine starters from a season ago. Hager was chosen to the Southland Conference Preseason Team. HBU went 5-12-2 overall and 4-7-1 in its first season in the Southland Conference, but the Huskies had a stellar 1.02 goals-against average from Walrath, Stephanie Castellon, and graduated senior, Shelby Horn. UTSA blanked host Incarnate Word, 2-0, in an exhibition match last Sunday. Kaytee O’Brien scored both goals for the Roadrunners. UTSA returns 13 letterwinners from a season ago and 86 percent of its offense. The Roadrunners went 5-12-2 overall and 4-4-2 in Conference USA. Baylor opens its regular season against Rice Friday night. The Bears split their exhibition matches, defeating Sam Houston State in Waco, 1-0, and losing at Florida, 2-0. Baylor went 11-6-3 overall and 3-4-1 in Big 12 play last season. The Bears lost in the conference semifinals to top-seed West Virginia. WILLIAMSPORT, PENNSYLVANIA (August 19, 2014) Pearland’s season ended in a 6-1 loss to the team from Chicago, Illinois in the 2014 Little League World Series at Howard J. Lamade Stadium on Tuesday, August 19. Joshua Gabino hit an RBI double in the 3rd for Southwest’s only score. Walter Maeker III was the losing pitcher with six strike outs in 3.6 innings. Less than two months have passed since little leaguers from around the world set on a global quest for being the best. Pearland, Texas represented the Southwest in United States by winning regionals with a 5-0 record. They were one of eight teams to represent thousands of teams in the United States. In the Little League World Series, there are eight teams that form the United States Bracket and eight teams selected internationally to form the International Bracket. Pearland was one of the top teams in the world and the performance during the four games is proof. In the four games played, Pearland used eight pitchers: Brandon Silwinski, Bryce Laird, Clayton Broeder, Jonathan Newman, Landon Donley, Matthew Adams, and Walter Maeker III - who combined for a total of 30 strike outs in just over 22 innings pitched. Throughout the series, there was one double play recorded by Pearland which involved Laird, Layne Roblyer, and Adams. Three home runs were hit in four games. Roblyer hit two for a total of five RBIs and Cole Smajstria hit the third for a series total of four RBIs. Michael Groover and Presley Smith had two RBIs while Laird, Hunter Dopslauf, Gabino, and Adams record one RBI each. Christian Terranova, Broeder, Smajstria scored 4 runs each during the series, Roblyer scored three times, and Silwinski, Laird, Adams, and Groover each scored twice. Walter Maeker III scored once in five times at bat. Southwest finished the Little League World Series with a record of 2 – 2. 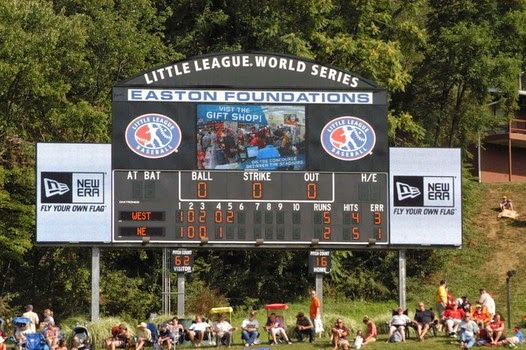 Williamsport, Pennsylvania – (Monday, Aug. 18) Wild pitches and passed balls help secure an 11-4 Southwest victory against Northwest in the 2014 Little League World Series Elimination round at Howard J. Lamade Stadium on Monday, August 18. As the games get closer to the Championship round, teams are having challenges in eligibility at the pitching position. Northwest, represented by Lynnwood, Washington used five pitchers in their final game allowing five runs to be scored due to five wild pitches. Southwest (Pearland) started the game strong on offense by stealing home on a wild pitch and on defense by a diving catch from Shortstop Matthew Adams to end the first inning. In the third inning, Pearland’s Layne Roblyer hit a three run home run. In the fifth, Southwest produced a rarely seen double play to end a rally brought on by Northwest. Landon “Landchops” Donley received the win. He pitched three innings, allowed three runs, and struck out four batters. Southwest will play Great Lakes on Tuesday, Aug. 19 at 7:30 p.m. EST. The game can be followed on ESPN. WILLIAMSPORT, PENNSYLVANIA (August 17, 2014) 32,000-plus fans attended Game 16 of the 2014 Little League World Series at Howard J. Lamade Stadium where Mid-Atlantic, from Philadelphia, Pennsylvania came from behind in the bottom of the sixth with two outs to beat Southwest (Pearland, Texas) by the score of 7-6 on Sunday, August 17, 2014. Mid-Atlantic led 3-2 going into the fifth. In the fifth, Southwest’s Cole Smajstria smashes a three-run home run deep over center field fence, putting Pearland on top 5-3. After a pitching change for Mid-Atlantic, Pearland scored one more run. Mid-Atlantic scored two runs in the fifth bringing the score to 6-5. In the bottom of the sixth with two outs and a runner on base, Mid-Atlantic’s Zion Spearman hit a hard triple to center field. Spearman scores the winning run when the next batter Tal Shanahan reaches base on an error. Mid-Atlantic’s Mo’ne Davis became the sixth female with a base hit at the Little League World Series out of a total of 18 girls who have played since 1974. In Mid-Atlantic’s opening round game, Davis was the winning pitcher. She will be available to pitch in Wednesday’s game against Las Vegas, NV at 7:30 p.m. EST. Southwest will play Lynnwood, WA on Monday, Aug. 18 at 3:00 p.m. EST. The game can be watched on ESPN. Sugar Land Skeeters down Camden. SUGAR LAND, TEXAS (August 17, 2014) The Sugar Land Skeeters got back on the winning track, downing the Camden Riversharks by the score of 4-3 in the third game of their current six-game home series in the Houston suburb of Sugar Land at Constellation Field on Sunday, afternoon, August 17, 2014. They are now 1-2 in their current home series with three more games, on Monday, Tuesday, and Wednesday, against the Riversharks. With the win, the Skeeters raised their second half record to 21-17 and their overall season record to 59-48. Camden got on the scoreboard in the top of the first inning when first baseman Jose Julio-Ruiz singles and sent left fielder Yasser Gomez home from third base. The Skeeters took the lead in the bottom of the second inning when right fielder Neil Medchill connected for a two run home over the right-center field fence. The home run, his fourth of the season, also scored catcher Todd Jennings, who had singled in his previous at bat. In 50 games this season, Medchill has 13 RBI. The Riversharks came back to tie the score in the sixth inning when designated hotter Brain Van Kick connected for a home run down the left field line. A single by first baseman Travis Scott in the sixth inning drove in left field Ryan Langerhans, from third base, to enable the Skeeters to regain the lead. The Riversharks came right back and scored another run on two error by Skeeter pitcher Gary Majewski and shortstop Bridger Hunt to tie the score at three-all. Sugar Land secured the victory when Hunt singled on his first pitch and scored Travis Scott from third base. The Skeeters and Riversharks next game will be Monday with a 7:05 p.m. first pitch. cylinders against the Atlanta Falcons. HOUSTON, TEXAS (August 17, 2014) It had been 336 days since the Houston Texans won a football game; and those 336 days have been hard for players, coaches and fans alike. 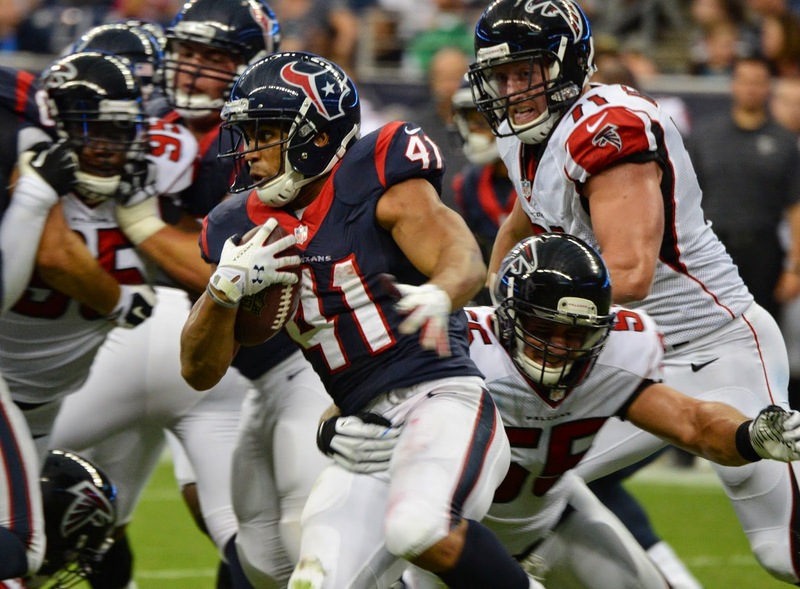 The 15-game losing streak is over technically over, as the Texans used a solid offensive and defensive attack to down the Atlanta Falcons by the score of 32-7 at NRG Stadium in Houston on Saturday, August 16, 2014. In actuality, this preseason game does not count on the Texans' won-loss record, by a victory is a victory, at least to the fans of the Battle Red, Deep Steel Blue, and Liberty White. Head coach Bill O'Brien was still content to start Ryan Fitzpatrick at quarterback and he played the entire first quarter, just as he did in the Texans' first preseason game against Arizona. Versus the Cardinals, Fitzpatrick completed 6-for-14 passes for 55 yards and threw two interceptions. The Texans were the first to get on the scoreboard; with 1:23 left in the first quarter. Houston Texans offense against the Falcons. ﻿Fitzpatrick handed off to rookie fullback Alfred Blue, who plowed one yard for the score, with Randy Bullock's splitting of the uprights for the extra point, from the 25-yard line, to make the score 7-0 at the end of the first quarter. The scoring drive was 69 yards on 12 plays and lasted 6:19. Fitzpatrick was replaced by rookie Tom Savage for the second quarter. Fitzpatrick completed 4-of-6 passes for 33 yards and rushed for 10 yards in the first quarter. The Falcons tied the score at the 1:32 mark in the second quarter when third string quarterback Sean Renfree completed a 12-yard pass to wide receive Devin Hester. After the score, O'Brien opted to return Fitzpatrick to the game for the remainder of the half, where he engineered a seven play, 74 yard scoring drive that lasted 1:13 and ended with an eight yard pass to wide receiver DeVire Posey. Bullock's extra point was wide to the right; making the score 13-7 at the end of the half. In the final drive of the half, Fitzpatrick completed 5-for-6 passes for 63 yards and carried the ball once for 15 yards. He finished the game competing nine of 12 passes for 97 yards. O'Brien commented on Fitzpatrick's play during the post-game press conference with the credentialed media. Case Keenum started the second half and drove the ball 58 yards in 10 plays before the Texans had to settle for a 40-yard field goal by Bullock; making the score 16-7 with 10:20 left in the third quarter. After a series of downs, the Falcons had their backs against the end zone, and on a fourth and eight play at their own four yard line, Matt Bosher dropped back into the end zone to punt the ball; which was tipped by Texans' tight end Anthony Denham. Running back Jonathan Grimes recovered the loose ball and scampered 17-yards for the score. Bullock's extra point was good to give the Texans a 23-7 lead with 14:03 remaining in the game. to keep the fans "involved" in the game. The Texans added an insurance touchdown at the 6:46 mark of the fourth quarter when rookie corner back Andre Hal stepped in front of a T.J. Yates errant pass, intended for rookie wide receiver Julian Jones, and returned the ball 64 yards for the score. Bullock again went wide right from 33 yards out on the extra point, to make keep the score at 29-7. Yates was again picked off at the 5:43 mark by linebacker Max Bullough, who returned the ball to the Falcon's 15-yard line. Savage returned to the game as quarterback and who went three-and-out before settling for a 33-yard field goal by Chris Boswell; making the score 32-7. Keenum finished the game with six completions on 12 attempts for 81 yards while throwing one interception, while Savage was 4-for-5 for eight yards. Defensively, the Texans' number one draft pick, Jadeveon Clowney, saw limited action in the game. However he rattled some of the Falcons' cages with a big sack of Matt Ryan and two major tackles on Ryan and running back Antone Smith. WILLIAMSPORT, PENNSYLVANIA (August 15, 2014) Over 16,000 games were played by more than 7000 teams from 80-plus countries in 40 days. Now there are 16 teams left to play in the 2014 Little League World Series at Howard J. Lamade Stadium. In the opening round, Southwest, represented by Pearland, Texas beat NewEngland, who is represented by Cumberland, Rhode Island, in a close game by the score of 6-4 on Friday, August 15, 2014. The game ended when a deep ball hit by New England’s Addison Kopack to Right-Center field was chased down and caught for the last out by Southwest’s Clayton Broeder with the tying run on base. Matthew Adams received the win for Southwest while Landon Donley was credited with the save. Adams threw 89 pitches in 4.2 innings, allowing only one run, and seven strikeouts. He will be eligible to pitch again on Wednesday. Pearland was in Williamsport at the World Series in 2010. Cumberland made their last appearance in 2011. Southwest will play Mid-Atlantic on Sunday, Aug. 17 at 7:00 p.m. EST in Game 16. This game can be followed on ESPN2. HOUSTON, TEXAS (August 15, 2014) With the Houston Texans beginning their current preseason schedule with a 32-0 loss to the Arizona Cardinals, many fans are wondering if 2015 is just going to be a reboot of 2013, where the Texans went 2-14. There have been a few changes on Kirby Street, with a new head coach, new offensive and defensive coordinators and a new starting quarterback, but what most people witnessed against Cardinals didn't seem like much of anything had changed. New head coach Bill O’Brien has implements changes designed to bring the Texans back to the top of the league and eventually lead them to the playoffs. The Falcons arrived in Houston on Tuesday, August 12 in preparation for the matchup; which includes three combined training sessions on Wednesday, Thursday, and Friday. Being able to practice with the team they are going to face on Saturday certainly should provide players from both teams to excell and catch the eyes of the coaches and staff who will determine if they will make it past the final roster cuts and be able to play the regular season. 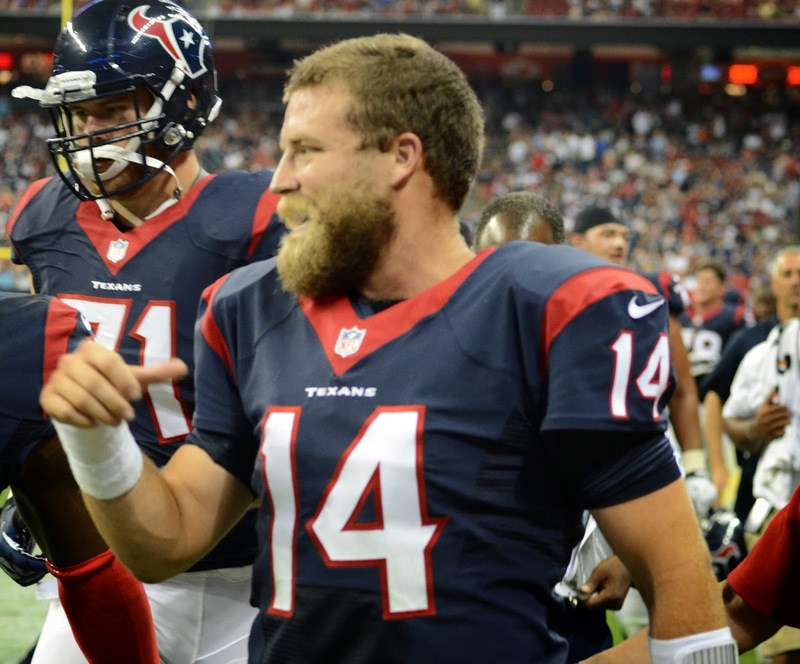 Ryan Fitzpatrick, who was signed as a free agent on March 20, 2014, started at quarterback and played the entire first half, completed six of 14 passes for 55 yards while throwing two interceptions. role as quarterback in 2014. Former Houston Cougars quarterback and Texans starting quarterback from 2013, Case Keenum completed three of five passes for 29 yards. He played the entire third quarter with rookie Tom Savage competing two of three passes for 14 yards. The offense could not seem to get the ball moving down the field; only generating 172 net yards and possessing the ball a little less than 18 minutes on offense. The only bright side from the game was the defensive duo of defensive end J.J. Watt and rookie linebacker Jadeveon Clowney. With each player seeing limited action, they both picked up a solo tackle, with Watt adding a sack to his preseason statistics. The duo were involved on every play and their penetration and aggressiveness will certainly help the Texans as the preseason continues and the regular season begins. The Falcons are coming off a 16-13 preseason win over the Miami Dolphins and a 4-12 record in 20-13. Game time on Saturday is set for 7 p.m. CDT in Houston.